FREE ESTIMATE. To auction, buy, consign or sell an Academy Award nomination, please contact Nate@NateDSanders.com or call Nate D. Sanders Auctions (http://www.NateDSanders.com) at (310) 440-2982. An Academy Award plaque can be big bucks. Not just for the winners. But, for the winners families and for all other sellers of the Academy Award nomination. The Academy Award nomination starts at $800 and can go as high as over $10,000. 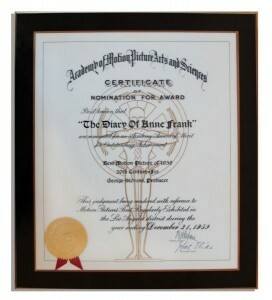 Here are some examples of Academy Award nomination s that we at NateDSanders.com have sold. 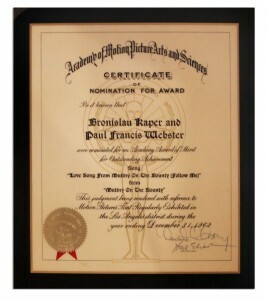 We believe that we have sold more Academy Award nomination s than any other auction house. Here is our most expensive Academy Award nomination sold. 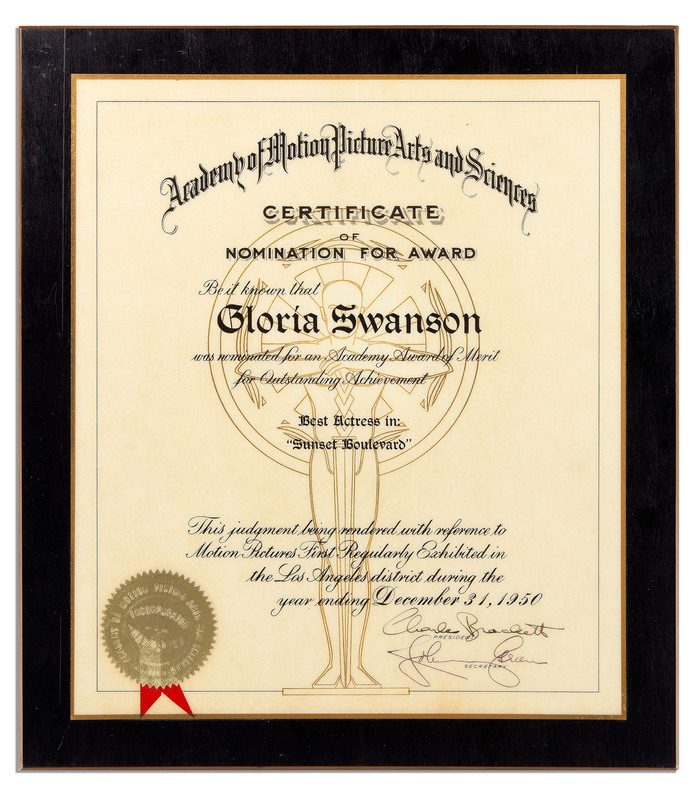 Gloria Swanson’s Official 1950 Best Actress Academy Award Nomination for ”Sunset Boulevard”. It sold for $14,271. 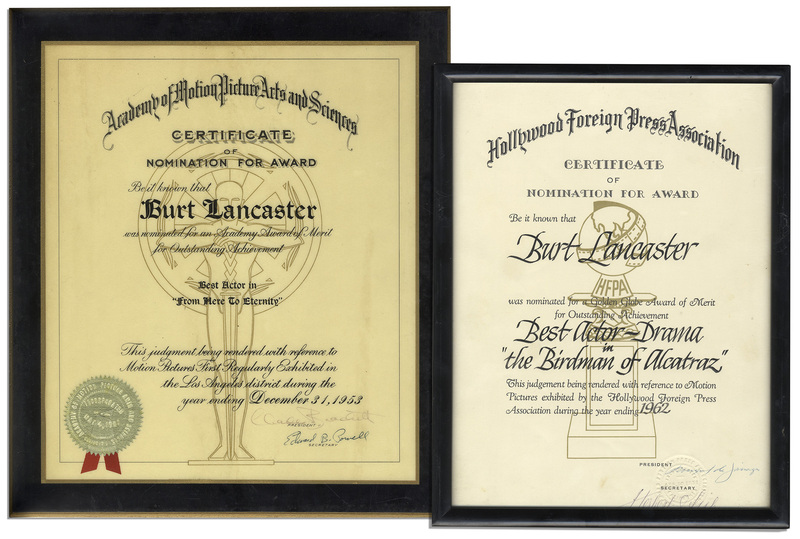 Our second most expensive Academy nomination was for Burt Lancaster for “The Birdman of Alcatraz”. 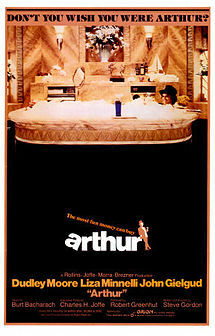 That Academy Award nomination sold for $5,000. We auctioned a Best Picture Academy Award certificate for ”The Diary of Anne Frank” — an incredibly rare award issued in 1959 to George Stevens, named on the certificate as Producer of the 20th Century-Fox feature. The film was nominated for 8 Oscars and won 3, this representing the coveted category of Best Picture — though the film lost for Best Picture to “Ben Hur.” It sold for $4,915. Everybody loves “The Deer Hunter”. We auctioned off the Academy Award plaque for that classic too. It sold for $4,061. 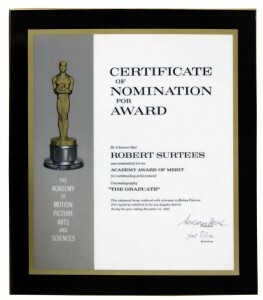 See this Academy Award nomination plaque for ”The Graduate,” nominating Robert Surtees for outstanding achievement in Cinematography. It sold for $3,049.20. 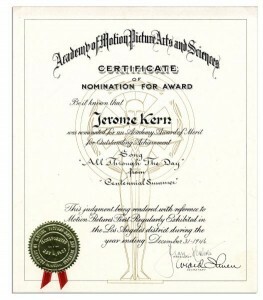 We also have amassed some cool film scoring nominations awarded to musical virtuosos like Jerome Kern, whose Academy Award certificate for his 1946 song “All Through the Day,” became posthumous. He was nominated posthumously at the 19th Academy Awards ceremony for this song from his score of the musical comedy “Centennial Summer,” his last film scored before his death. 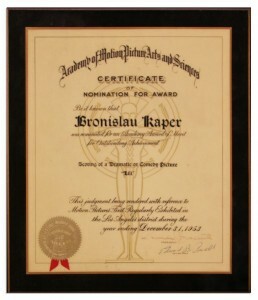 We also auctioned two nominations from Polish film composer Bronislau Kaper, virtuoso composer of films like “Mutiny on the Bounty.” This Academy Award nomination plaque was for Best Score for the musical film “Lili”. It sold for $1,172. 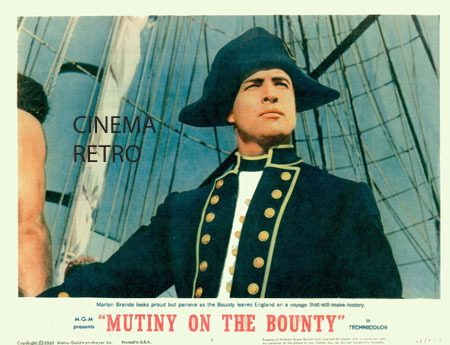 He won, and repeated the win in the same category in 1963 for his famed scoring of ”Mutiny on the Bounty,” the film based on the true story of a mutiny aboard an English ship bound for Tahiti. We’re auctioned his nomination from that win for his composition, ”Love Song From Mutiny On The Bounty (Follow Me)”. 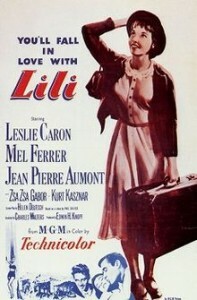 He won for Best Song and Best Score — and the film also won Best Picture that year. It sold for $3,049. FREE ESTIMATE. 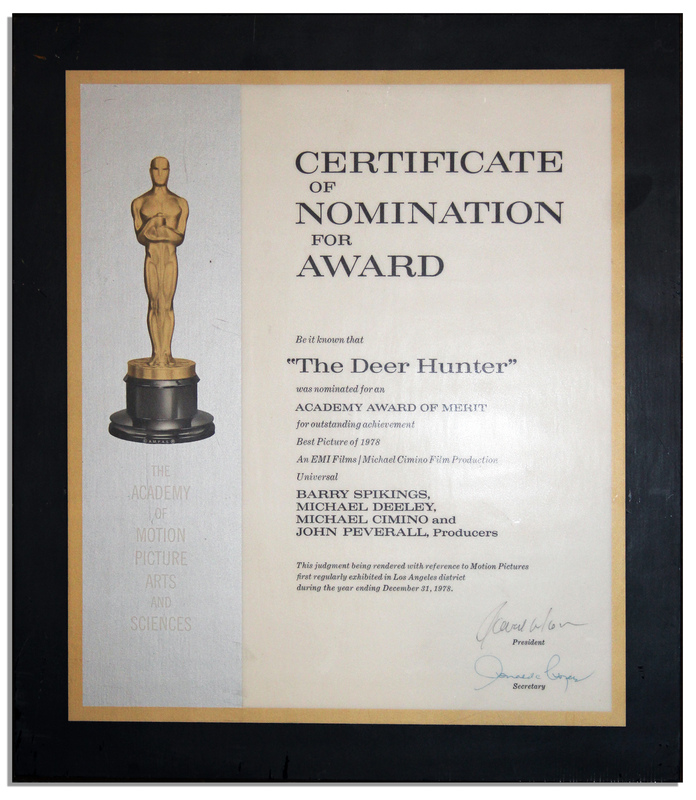 To auction, buy, consign or sell an Academy Award plaque, please contact Nate@NateDSanders.com or call Nate D. Sanders Auctions (http://www.NateDSanders.com) at (310) 440-2982. Top dollar obtained for your Academy Award Nomination.